Ever hear someone say their first tattoo was done by a “scratcher” or a tattoo artist say they were “Loyal to the coil,” but weren’t entirely sure what those words were referring to? What really is the difference between “custom” work and “flash” tattooing? Well have no fear! Here we’ve got you covered with a list of some of the most common tattoo terms, lingo and slang so you know what certain words and phrases mean for next time you step into that tattoo studio. Aftercare—The process of caring for a new tattoo for the first two to four weeks after getting one. This usually consists of washing it with unscented soft soap, applying hydrating ointments and lotions, and avoiding exposure to sunlight and bodies of water for long periods of time. American Traditional—One of the most popular styles of tattooing based on black outlines, a minimal, yet bold color palette, and iconic tattoo imagery. Apprentice—Someone who has been taken under the wing of an established tattooist and is learning to tattoo under their guidance. Typically an apprentice works under a tattooist for several years learning how to properly use and build a tattoo machine as well as how to apply ink into skin and skillfully design a piece based on body flow and skin type. Autoclave—A machine that uses steam and high pressure to sterilize tattoo equipment before and after each tattoo session. Biomechanical—A style of tattooing also referred to as “biomech” in which a tattooist designs a piece (usually freehand) based on the client’s body flow in order to recreate a robotic or cyborg-like aesthetic to the client’s skin. Black and Grey—A style of tattooing that consists of using only black ink and water. The black ink is watered down in order to create softer shades of grey for shading and highlighting. Nowadays, it is also common to see tattoo artists use black ink and premade grey washes when working in black and grey. Blackwork—A style of tattooing characterized by using only bold, black geometric shapes to make various images or designs. Blowout—This is what occurs when a tattoo is not applied properly and goes too deep into the skin. This causes the ink to “settle” strangely creating a minor cloudy effect around the initial design.Body Suit—When the majority of someone’s body is covered in tattoos. Canvas—Also known as “a skin” is another name for a client about to get tattooed. Coil—A tattoo machine that is powered by an electromagnetic coil. This is the most commonly used type of tattoo machine. Collector—A client who gets tattoos in the same way an art collector would go after art, by searching out and getting tattooed by highly qualified custom tattooists. Cosmetic Tattoos—Also known as permanent makeup or medical tattoos, this tattoo technique adds pigmentation to client’s skin for various cosmetic purposes. Standard cosmetic tattoos include having one’s eyebrows tattooed on after chemotherapy, having discolored skin re-pigmented due to skin conditions like vitiligo, or having breast reconstruction after mastectomies. Cover-Up—A tattoo designed on top of an older tattoo in order to cover the older one up. Good cover-ups usually camouflage the old tattoo through a use of line work and strategic coloring. Many tattoo artists specialize in cover-ups. Custom Work—A tattoo that has been drawn, designed and tattooed specifically for one client by his/her tattoo artist. Dotwork—A style of tattooing consisting entirely of dots in order to create various designs and images. Mandalas, sacred geometry and stipple portraits are common forms of dotwork. Flash—Pre-designed images that can be purchased by tattoo artists or clients as templates for tattoos. Most flash comes as a collection of images to choose from on sheets and is most commonly used nowadays for wall displays in shops, choice designs for charity events, and to teach apprentices. Free Hand—When a tattoo artist draws a tattoo design directly onto a client’s skin without using a stencil. Fresh—The term used to describe a brand new tattoo before it has fully healed. Geometric—A style of tattooing based solely on the use of geometric shapes and lines rather than shading. Healed—The term used to describe a tattoo two to four weeks after the tattoo has been applied giving the client’s skin time to accept the now-settled tattoo. Horror—A style of tattooing that consists mainly of dark imagery. This style can be prominent in either black and grey or color, but typically features fabricated creatures or characters taken from famous horror films. Illustrative—A style of tattooing that combines aspects of American Traditional and realism typically using bold outlines and realistic shading to depict illustration-like designs. Maori—The indigenous people of New Zealand known for their use of extensive body markings to represent cultural identity and status. Neo—The prefix used to describe adding more realistic depth, shading, and detail to an older style of tattooing. Neo-Traditional and Neo-Japanese are the most common forms of “Neo-“ tattooing. New School—A style of tattooing similar to the illustrative style but focused on a more cartoonish and exaggerated aesthetic. Most New School pieces depict personified animals or dramatic characters in bizarre situations. Animals in fancy clothing and bobble-head pin-up girls are common New School images. Ornamental—A style of tattooing that is based on decorative design, geometric shapes, body flow and color scheme more so than an actual subject. Pin-Up—A classic style of tattooing images of women derived from, but not limited to, American Traditional. Portfolio—The collection of past work an artist has for his/her clients to view in order to get a feel of their particular style. 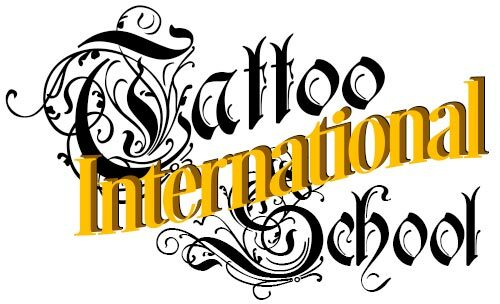 Many tattooists nowadays have both hard copies of portfolios in shops as well as online via their websites or Instagram pages. Realism—A style of tattooing in which tattoos are depicted as they would be seen in real life. This style focuses more heavily on shading than it does line work. One of the most common styles of realism is portraiture. Rotary Machine—A tattoo machine that is powered by regulated electric motors. Sailor Jerry—The nickname given to Norman Keith Collins, a tattooist who helped popularize American Traditional tattooing through his work with inking sailors in the 1920s and 1930s. He is one of the most iconic tattoo artists in history. Scratcher—Someone who tattoos without any training, health code regulations or the proper use of equipment typically causing damage to the skin of people they ink. Shop—Typically a shop is a place where a select group of tattoo artists work and allow for walk-in tattoo sessions. Sleeve—When someone has his/her entire arm tattooed, typically wrist to shoulder. Sleeves can also be found on legs and are referred to as “leg sleeves” which include tattoos from the ankle all the way up the thigh. Stencil—A transfer of a design from paper to skin in order to give the tattoo artist the basic guidelines for placement, line work and shading when tattooing. It is is most commonly used when tattooing pre-designed pieces, such as custom work or portraits that are not freehanded. Stick and Poke—A method of DIY tattooing in which a single needle is dipped in ink and then poked through the skin repeatedly until a design is completed. Street Fighter Tattoo—A slang term given to optical illusion tattoos in which the limbs of tattooed characters are incorporated into the wearer’s limbs. This style was first popularized by using characters from Street Fighter as the subjects, though any character can be used for the illusion. Studio—A place where one tattoo artist or a small collective of tattoo artists work typically on appointment-only custom tattoos. Ta Moko—This is the term commonly used for traditional Maori tattoos or body markings in which chisels and pigments are used to bring about these uniquely designed patterns. Ta moko are still prominent to the Maori culture today. Tattoo Gun—An incorrect and highly disliked term for a tattoo machine. Tattoo Machine—The proper name for the device used to apply tattoos based off of Thomas Edison’s design for the electric pen. The most common forms of tattoo machines are coil and rotary. Tebori—An ancient form of tattooing that originated in Japan and is still used today. It literally means “to carve by hand” in which each tattoo is actually carved into the client’s skin rather than tattooed with a standard machine. Traditional Japanese (Irezumi)—This is a style of tattooing popularized in Japan most prominently by the Yakuza, the criminal underworld. This style typically features bold outlines, minimal shading and imagery that includes mythical beasts, koi fish, flowers and Japanese folklore characters. Tramp Stamp—The slang term given to tattoos on someone’s lower back. Trash Polka—A style of tattooing done solely in a black and red color scheme that is characterized by collage-like imagery, incorporating scattered moments of realism, lettering, abstract and geometric styles. Tribal (modern)—A style of tattooing imitating traditional Maori or Polynesian body art. It is characterized by thick lines and semi-organic shapes that are filled in almost exclusively with black. Watercolor—A style of tattooing that imitates the brushstroke aesthetic and color palette of watercolor paintings. Yakuza Style—A style of tattooing based off the tattoo aesthetic used by the Yakuza, the Japanese criminal underworld. This style is typically inked in a body suit-like fashion, however it intentionally leaves any visible skin while clothed as well as one panel of skin going down the wearer’s stomach untouched. Standard Yakuza style pieces also feature full themes or stories carried out through a traditional Japanese style and imagery. Yantra—An ancient form of tattooing that originated in Southeast Asia and is found predominantly in Cambodia, Thailand, and Laos. This style of tattooing uses a sharpened bamboo stick to tap the design into the wearer’s skin. Yantra tattoos are typically designed by ruesi (hermit sages of Southeast Asia) or Buddhist monks and are believed to be magical symbols of protection and power, and thus are typically traditional images reminiscent of Southeast Asian folklore.